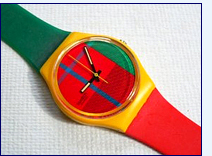 Ok, admit it, you had a Swatch Watch, didn’t you…..
Swatch Watches were, like, totally in, back in the 80s, weren’t they? Like, oh my gosh, you were a total loser if you didn’t have one, right? CLICK HERE to see the top 15 watches of 2008. But, here are a couple showing on the list. Looking kinda different, aren’t they? So, who’s willing to admit he/she had a Swatch watch with the little plastic “guards” over it??? This entry was posted in Uncategorized and tagged 80s watches, Pop Culture, Swatch watches, Then and Now Thursdays by Lynn Rush. Bookmark the permalink. My husband and I can spend 28 hours taking pix like those. So stinkin’ hilarious, and I don’t even know what you REALLY look like!! Count me in. I was a Swatch-wearer, too. Funny thing is, I just ran across it in my jewelry box when I was home for Christmas. I didn’t have a swatch but I had a mood ring. Anyone rememeber those? OHHHHHH, now I know what you mean. I totally remember those….. SWEET! A slap wrap was a bracelet that started out stiff, and then you slapped it against your wrist and it wrapped into a bracelet. Then they got banned from my school because they made a loud snapping sound when they hit your wrist and teachers got annoyed. Am I the only one who remembers those? Billy—you’re so funny.Yeah, they look kinda plastic, huh? Janelle–Friendship pins. OMG…..I’m gonna have to do that one some day on Then and Now!!!! I loved friendship pins. Sarah–a “slap wrap” What the heck is that? And they got banned? What’s up with that? Kat–a GLOW watch? You’re kidding….I don’t remember those. Rosslyn—I don’t remember Keith Haring watches. They were Swatch? But hey, my memory stinks. LOL. The coolest of all Swatch watches were the Keith Haring watches. Do you remember them? At least, I think they were Swatch. Oh my gosh! Swatches. Remember the Run DMC commercials advertising Swatches. Awesome stuff. I didn’t have a Swatch Watch, but I had a Glow Watch. Later on, I bought a cheapo imitation Swatch with the watch guards. I didn’t have a swatch, but I did wear my “slap wrap” bracelet proudly! Before they got banned from school, that is. I think I remember them, but I didn’t have one. To this day, I never wear a watch. It’s oppressive. . .okay that’s dramatic, I just can’t stand anything tight against my wrist. Now, gold/diamond dangly bracelets – Yeah! Yes, had a swatch…it went well with the friendship pins on my shoes. I will admit it without reservation. I loved my Swatch. Cool then, but kinda ugly now, huh? Don’t worry, Alison. I was a loser too. I did eventually get one as a gift, I think. Can’t remember. But some kids, they had like three or four. Remember? They’d wear them all at once? LOL. –Stephanie, they had ones that smelled? Man, I was out of it, I don’t remember that. So, a mix of sweat and strawberries….. This does bring back memories! I’ll admit, I was one of those “losers”…we couldn’t afford most of the cool trends when I was growing up. I’m scarred as an adult because of it. =) Kidding! And the guards–I remember the big thing at my school was to put on two of them, twisted. Oh my gosh. I had one of those watches! It was PINK. And it had a scent to it…strawberry. Problem was, it was NOT made of breathable material so it made you sweat. I hardly ever sweat and sweat just pooled beneath it. Ick. Then, after I took it off, my arm would smell like strawberries until I showered.